Mission Valley is a wide river valley trending east-west in San Diego, through which the San Diego River flows to the Pacific Ocean. Mission Valley nowadays serves as an important shopping and entertainment center for San Diego. Many condominiums and apartments can be found in the area as well. Mission Valley stretches as far west as Interstate 5 and as far east as Interstate 15. The exact boundary between Mission Valley East and West is State Route 163 that takes you to downtown. You will find tree major shopping malls located in Mission Valley. Fashion Valley Mall, Hazard Center Mall and Westfield Mission Valley. Many other commercial developments can be found in the valley as well, including smaller shopping plazas, auto malls and vocational schools. 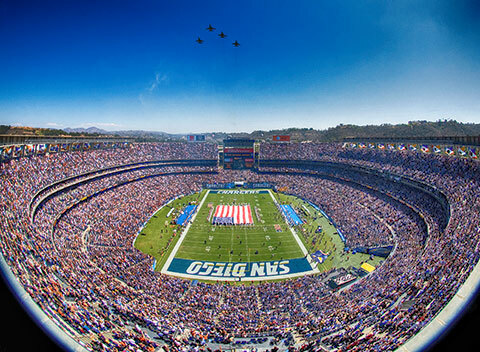 Qualcomm Stadium, home of the San Diego Chargers and the San Diego State University (SDSU) Aztecs football teams, is located in Mission Valley East near the I-8 and I-15 interchange. The Green Line of the San Diego Trolley system runs through Mission Valley. The main hub for buses is located at the Fashion Valley Transit Center and Mall. Other trolley stations in the valley are found at Morena, Hazard Center, Mission Valley Center, Rio Vista, Fenton Parkway, and Qualcomm Stadium. Mostly a young adult crowd of working professionals. Those looking for central convenient living and easy commute to work. Want to live close to shopping areas and entertainment? Those looking for a quite living and non stop options for entertainment and shopping. Low to mid range condos, townhomes and a few newer row-homes and detached homes. Most of the Mission Valley Condo Communities have an easy access to the five Trolley Stations and both Mission Valley and Fashion Valley shopping centers. Call us with any questions and more information on Mission Valley San Diego. Buying a condo in Mission Valley? We know the Mission Valley San Diego market and the Mission Valley condos for sale. Use our Mission Valley home search tools to view condos, townhomes, studios and investment property for sale in Mission Valley. Find golf course, mountain and city view, river view, and riverfront condos and townhomes listed for sale in Mission Valley. Call us today at 619-921-0284 to schedule a condo showing or for additional information. on any condo listings that you see in Mission Valley and the surrounding areas. Fashion Valley, Mission Valley, Missions at Rio Vista, Escala, Verandas at Escala, Courtyards at Escala, Escala Village Bungalows at Escala, Terraces at Escala, Bridges at Escala, The Lido, Union Square, Mission Walk, Mission Gate, Kensington Park Villas, Mission Bellwood, River Scene, Mission Playmor, Friars Mission, River Colony, Mission Greens, Mission Verde, The Franciscan, River Colony II, Park Villas South, Creekwood at River Run, Mission Village, Mission Heights, Mission Ridge, The Bluffs, Mission Plaza, Park Villas North, Rancho Mission Villas and Friars Pointe.